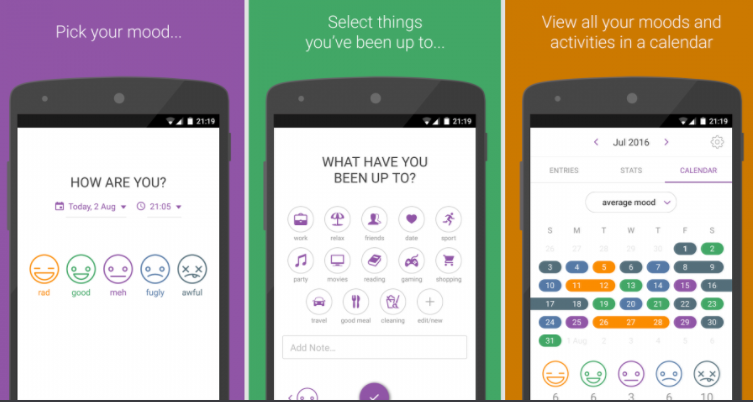 Daylio is a mood journal that aims to help users track moods and related activities. The program’s main feature is the mood log where users can rate their mood on a 5-point scale (from “rad” [superb] to “awful”) at any given time and record the activity they were doing at the time of the log. Users can select an activity from the activity menu or add one. Logs can also be entered retroactively. When a sufficient amount of data has been entered, the information is presented in various graphs (e.g., average daily mood, monthly mood chart). With an additional fee, users can unlock more features, such as ad removal and an option to download records as a CSV file. Additional features include reminders and an option to change languages. Daylio is a program suitable for users who are seeking to identify their mood patterns over time. Log entry is quick and easy, and the graphs are user-friendly and easy to understand. The support of various languages contributes to the program’s accessibility. On the downside, even though the ads can be removed for an extra fee, they can be somewhat annoying.